High-Speed PadsStandard PadsBrush or Pad? Aqua Burnishing Pad - Ideal for high-frequency, high-gloss burnishing programs on softer floor finishes (Replaces beige pad). Black Sanding Screen - Perfect for sanding dull and scuffed wood floors. Open-weave mesh design is nonloading and coated on both sides for reversible use - wet or dry. Natural Hair Burnishing Pad - Natural hair and synthetic fiber pad works well on a wide variety of floor finishes and traffic conditions. Natural Hair Extra Burnishing Pad - Greater percentage of natural hair and synthetic fiber pad designed for low-frequency burnishing programs on harder floor finishes. Ultra Champagne Burnishing Pad - Designed for low to moderate burnishing programs on hard floor finishes. Black Stripping Pad - For heavy-duty floor stripping. Blue Scrubbing Pad - For scrubbing or heavy-duty spray cleaning. Removes soiled top layers of finish. 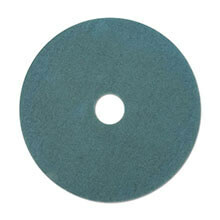 Green Scrubbing Pad - Ideal for heavy-duty scrubbing or light stripping. High-Performance Stripping Pad - Very aggressive stripper. Open end web formulation for repeated washings and prolonged life. Red Buffing Pad - For spray buffing, cleaning and polishing. White Polishing Pad - Light dry-polishing or water spray for high gloss.